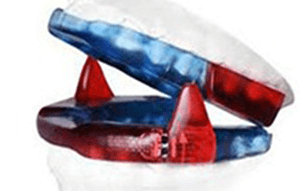 There are over 100 different types of oral appliances on the market. At Sleep Rehab, we only utilize those that are top-of-the-line, and FDA approved. Each one is custom-made so we can ensure every patient receives personalized, effective treatment. Over the years, Dr. Fedosky has tested multiple styles. Have any questions about our appliances? Give us a call and one of our sleep professionals will help answer your questions. With the new high precision 5 Axis milling machine, our lab can create an extremely accurate, crystal clear and impressively strong device. They utilize the newest CAD/CAM digital software and highly trained technicians to ensure an accurate fit and silky smooth finish to your milled devices. The new milled line of OSA devices, like the DynaFlex Dorsal®, includes a 3 Year Warranty. The Respire Blue Series has a mesh support that is welded and placed inside the acrylic. This improvement offers one of the strongest dorsal fin designs on the market, The Respire Blue is easy to adjust, where each turn off of the screw is equal to 2 /10 mm. 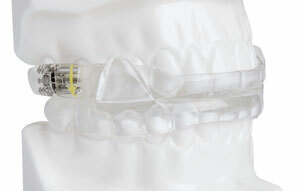 This oral appliance has more room in the anterior area and allows the patient to open and close as they please. It is also open in the front to add comfort by increasing the tongue space allowing the patient to inhale and exhale more air per breath. This oral appliance can also be made with a soft layer on the tooth surface to add additional comfort and comes with a 3 year warranty.